The original 7-day soup diet is said to have originated in a Toronto hospital but there is no evidence that this is true. For seven days you have the soup daily for dinner and can also eat it liberally throughout the day. There are many versions of the vegetable soup from which to choose. Follow this strict schedule while on the soup diet. Day 3: Soup plus fruits but no bananas; vegetables but no potato; eat all the fruits and veggies you want. There is not one definitive 7-day soup plan. Review several options to decide which one appeals to you the most, keeping in mind that you're more likely to stick with the diet for the full seven days if you're eating flavors you like. Food.com: The soup in this recipe contains a mix of four vegetables and five spices in a tomato base. Good Housekeeping: This soup has more vegetables and fewer spices than the Food.com version. Marie Claire Cabbage Soup Diet uses a cabbage soup as the basis of a 7 day soup diet plan. This soup has fewer vegetables but you get to choose your spices. Weight Loss Magic Soup Diet is a heartier soup because it contains more vegetables. Italian seasoning also jazzes up the flavor. Slimming Solutions Soup has fewer vegetables than the Weight Loss Magic Soup but it adds several herbs and hot pepper to spice it up. The GM Soup Diet is said to have been developed at General Motors (GM), though there is no proof of this. There is even an Indian and a Vegetarian version of the GM diet. The LoveToKnow (LTK) Basic Soup contains a filling combination of vegetables, including the nutrient-dense mushrooms and kidney beans. Though the kidney beans add carbs, as a legume it also counts as a protein. The mushrooms also add protein and a meaty texture. The variety of spices saves the soup from the blandness of the original basic version. Wash and prepare the vegetables: Cut carrots in small wedges or slices; cut green beans in thirds; thinly slice the mushrooms and cabbage; chop the onions and thinly slice the green onions, keeping the white stalk and the green slices separate; if using plum tomatoes, chop and crush them and preserve the juice. Saute: Spray the bottom of a 12 quart stockpot or Dutch pot with non-stick oil spray. Over medium heat, saute onions, white stalks and half the green parts of the green onion, and the garlic, carrots, mushrooms and celery for 8-10 minutes until onions are translucent. Alternatively, use 1-3 teaspoons of olive oil for the saute (your preference). Add the rest: Throw in the diced/crushed tomatoes and juice, the green beans, cabbage, broth, water, salt, pepper, garlic, oregano, and the sprig of thyme. Simmer: Stir the pot well and cover and simmer on low heat for 10-15 minutes, stirring occasionally. Almost done: When carrots are almost tender, stir in spinach and the rest of green onion leaves for that last burst of flavor, and simmer for 5 more minutes. Remove from heat and stir. You can add more of the spices to suit your taste. This makes 48 cups and a serving size is two cups, which is about 90 calories based on calculations from the United States Department of Agriculture National Nutrients Database. Cut chicken beef or lamb in bite sized portions and saute in a skillet in one teaspoon of olive oil on medium heat. Turn heat to low, add a 1/4 cup of water and a pinch of salt and black pepper and cover. Simmer for about 10 to 20 minutes until meat is cooked and add it to the heated vegetable soup. For shrimp or fish (cut fish in one inch portions) saute in a small amount of olive oil for two or three minutes until opaque. 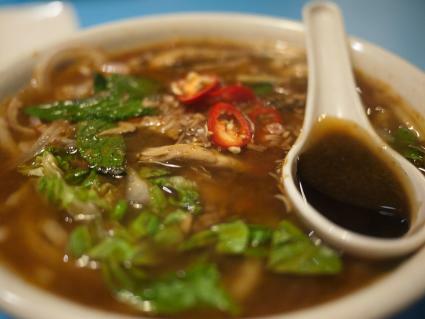 You can use the LTK soup to support a healthy weight loss plan of about 1200-1300 calories a day. Avoid staying on a low calorie diet for an extended time and speak with your doctor first. Add exercise to boost your weight loss and help you maintain the loss after your diet ends. 250-300 Calorie Breakfast: Start each day with a healthy breakfast that is high in protein. 50-100 Calorie Snacks: Enjoy a midmorning and afternoon 50-100 calorie healthy snack, for example:, a serving of fruit or non-starchy vegetables such as carrots or celery, or a cup or two of LTK Basic Soup (45-90 calories). Drinks: Drink at least eight glasses of water or unsweetened drinks, including coffee or tea. Eating soup filled with healthy vegetables every day is a great addition to a healthy reduced-calorie diet plan. However, if you don't supplement it with protein or additional essential nutrients, you will not fulfill your daily nutrients and calorie needs. As with any low calorie diet plan, be sure to talk with your doctor before starting.